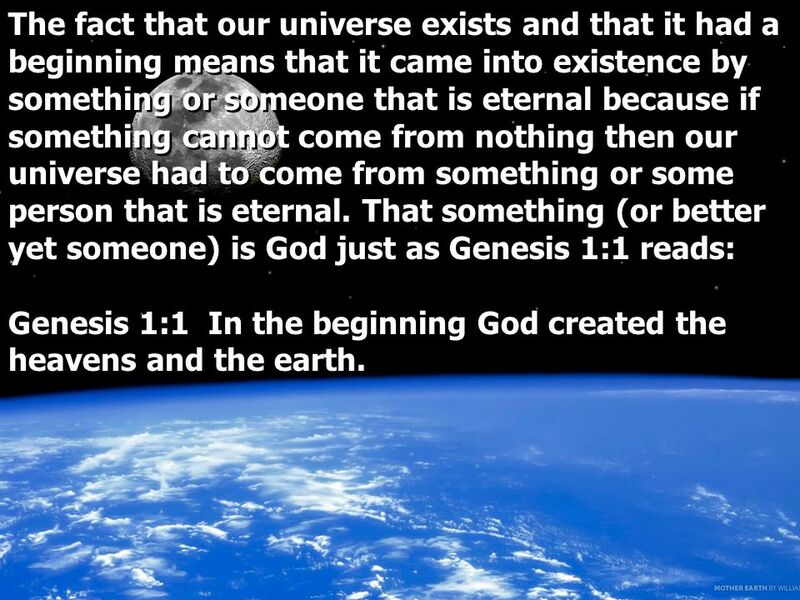 THE EVIDENCE FOR THE EXISTENCE OF GOD Part 1 THE EVIDENCE FOR THE EXISTENCE OF GOD Part 1. 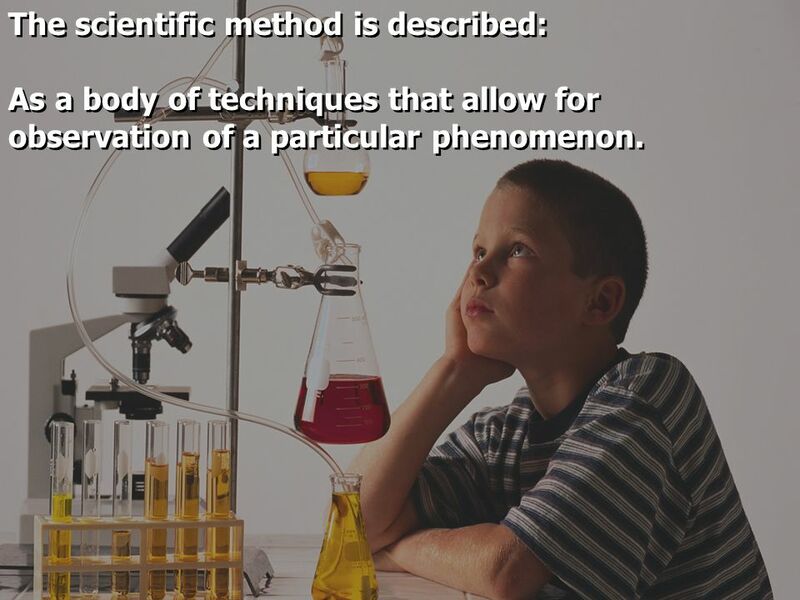 2 The scientific method is described: As a body of techniques that allow for observation of a particular phenomenon. 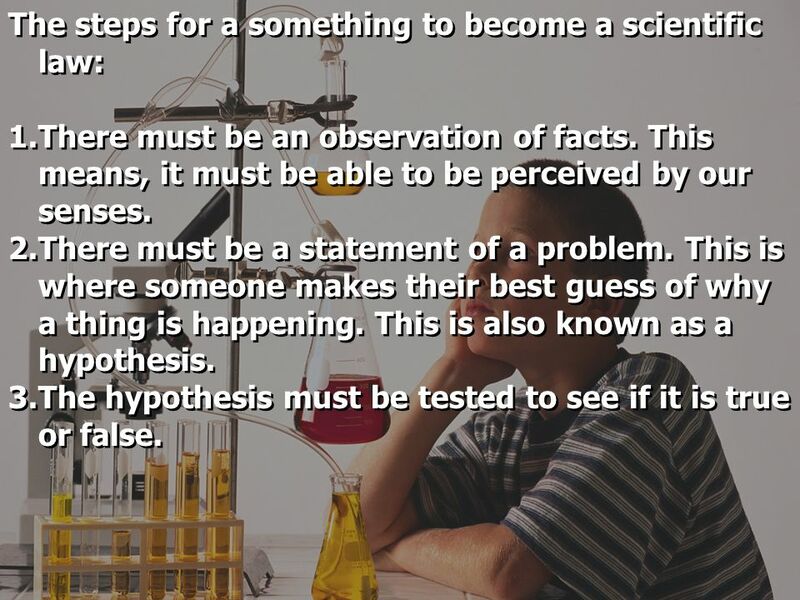 The scientific method is described: As a body of techniques that allow for observation of a particular phenomenon. 3 The steps for a something to become a scientific law: 1. 1.There must be an observation of facts. This means, it must be able to be perceived by our senses. 2. 2.There must be a statement of a problem. This is where someone makes their best guess of why a thing is happening. This is also known as a hypothesis. 3. 3.The hypothesis must be tested to see if it is true or false. The steps for a something to become a scientific law: 1. 1.There must be an observation of facts. This means, it must be able to be perceived by our senses. 2. 2.There must be a statement of a problem. This is where someone makes their best guess of why a thing is happening. This is also known as a hypothesis. 3. 3.The hypothesis must be tested to see if it is true or false. 4 4. 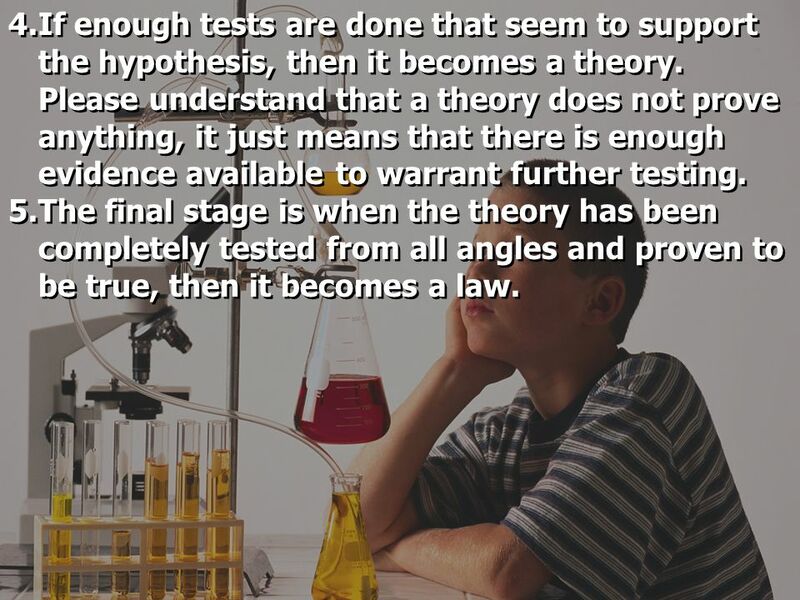 4.If enough tests are done that seem to support the hypothesis, then it becomes a theory. Please understand that a theory does not prove anything, it just means that there is enough evidence available to warrant further testing. 5. 5.The final stage is when the theory has been completely tested from all angles and proven to be true, then it becomes a law. 4. 4.If enough tests are done that seem to support the hypothesis, then it becomes a theory. Please understand that a theory does not prove anything, it just means that there is enough evidence available to warrant further testing. 5. 5.The final stage is when the theory has been completely tested from all angles and proven to be true, then it becomes a law. 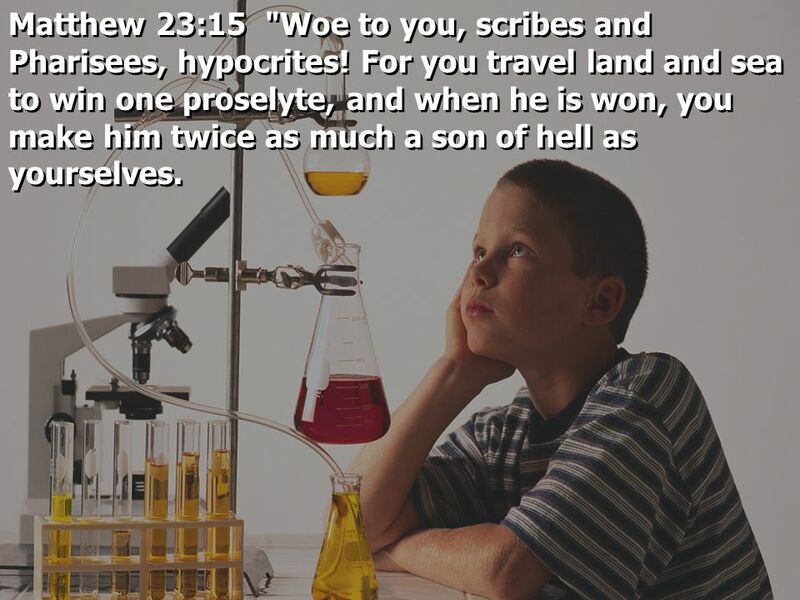 5 Matthew 23:15 "Woe to you, scribes and Pharisees, hypocrites! For you travel land and sea to win one proselyte, and when he is won, you make him twice as much a son of hell as yourselves. 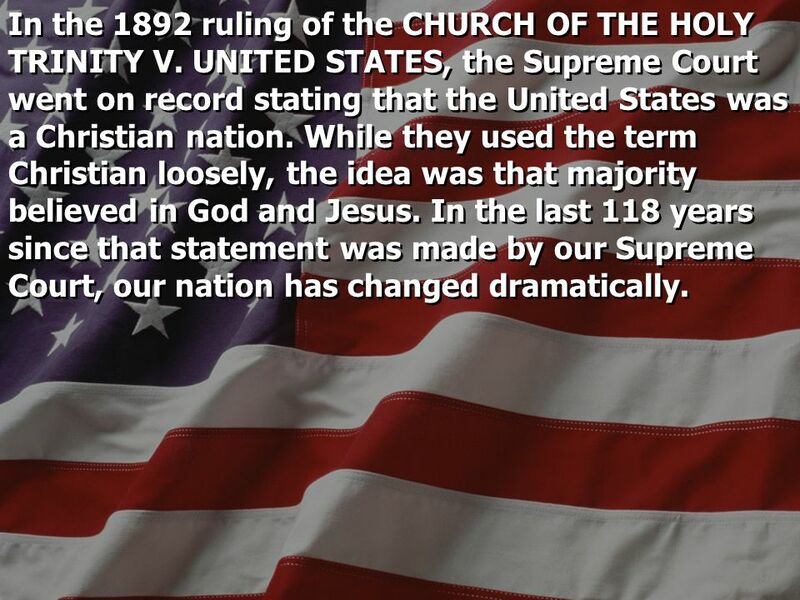 6 In the 1892 ruling of the CHURCH OF THE HOLY TRINITY V. UNITED STATES, the Supreme Court went on record stating that the United States was a Christian nation. While they used the term Christian loosely, the idea was that majority believed in God and Jesus. In the last 118 years since that statement was made by our Supreme Court, our nation has changed dramatically. 7 In 2002 the liberal 9th Circuit Court of Appeals in California ruled the phrase under God in the Pledge of Allegiance was unconstitutional. The court said: In the context of the Pledge, the statement that the United States is a nation under God is an endorsement of religion. It is a profession of a religious belief, namely a belief of monotheism… A profession that we are a nation under God is identical, for Establishment Clause purposes, to a profession that we are a nation under Jesus a nation under Vishnu, a nation under Zeus, or a nation under no god because none of these professions can be neutral with respect to religion (Judge Alfred T. Goodwin). 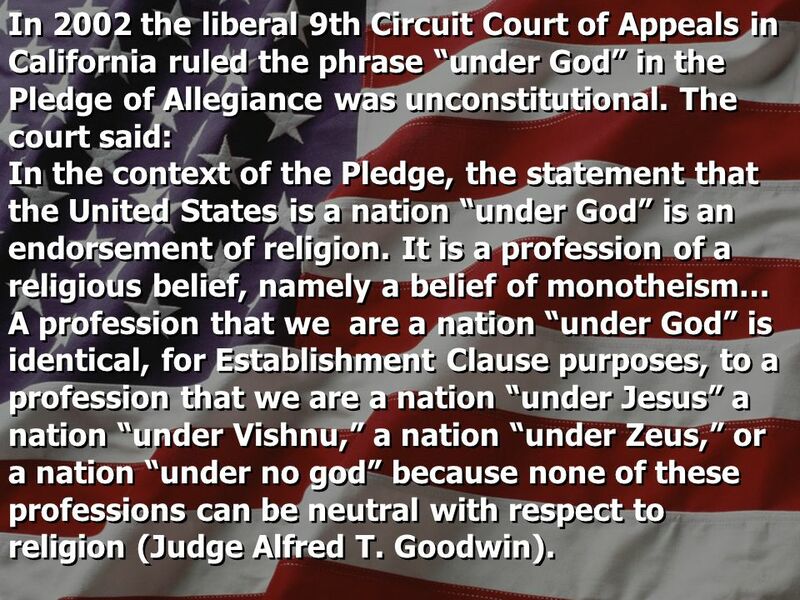 In 2002 the liberal 9th Circuit Court of Appeals in California ruled the phrase under God in the Pledge of Allegiance was unconstitutional. The court said: In the context of the Pledge, the statement that the United States is a nation under God is an endorsement of religion. It is a profession of a religious belief, namely a belief of monotheism… A profession that we are a nation under God is identical, for Establishment Clause purposes, to a profession that we are a nation under Jesus a nation under Vishnu, a nation under Zeus, or a nation under no god because none of these professions can be neutral with respect to religion (Judge Alfred T. Goodwin). 8 If we keep losing our children to the philosophies of men, one day we may find that: all public declarations of God, the Bible, or Christianity will have to be removed, which includes our national motto, In God We Trust. Military graveyards would no longer be able to use crosses for headstones. Religious ceremonies for government officials and the military would have to cease. Public prayer before sporting or civic events would be outlawed. The president would no longer be sworn into office with his hand on the Bible. 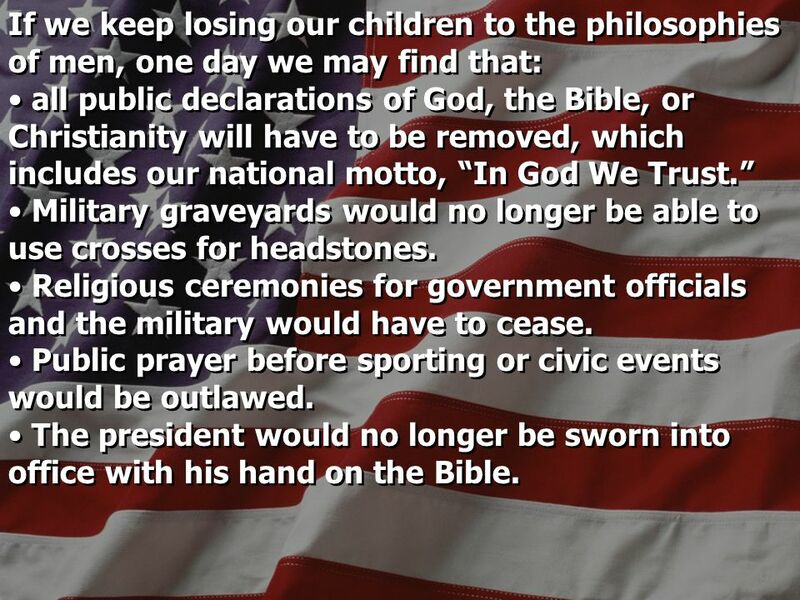 If we keep losing our children to the philosophies of men, one day we may find that: all public declarations of God, the Bible, or Christianity will have to be removed, which includes our national motto, In God We Trust. Military graveyards would no longer be able to use crosses for headstones. Religious ceremonies for government officials and the military would have to cease. Public prayer before sporting or civic events would be outlawed. The president would no longer be sworn into office with his hand on the Bible. 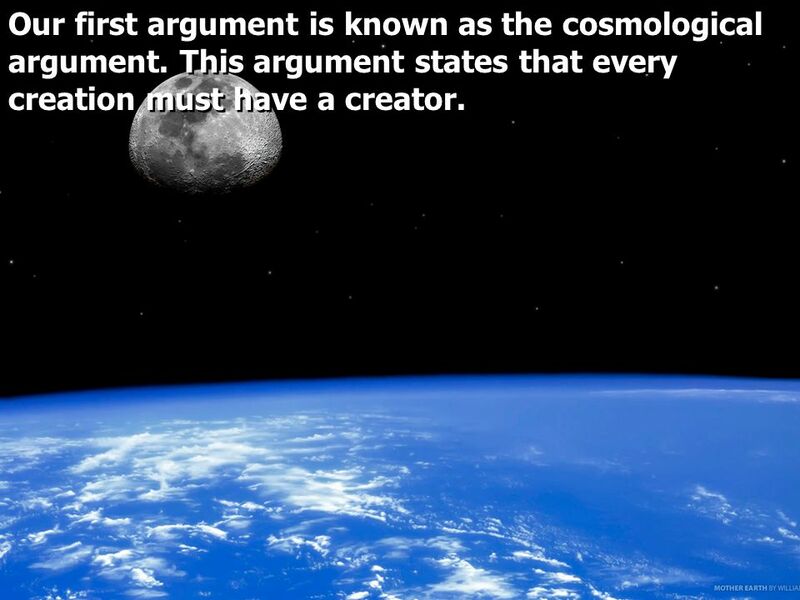 9 Our first argument is known as the cosmological argument. 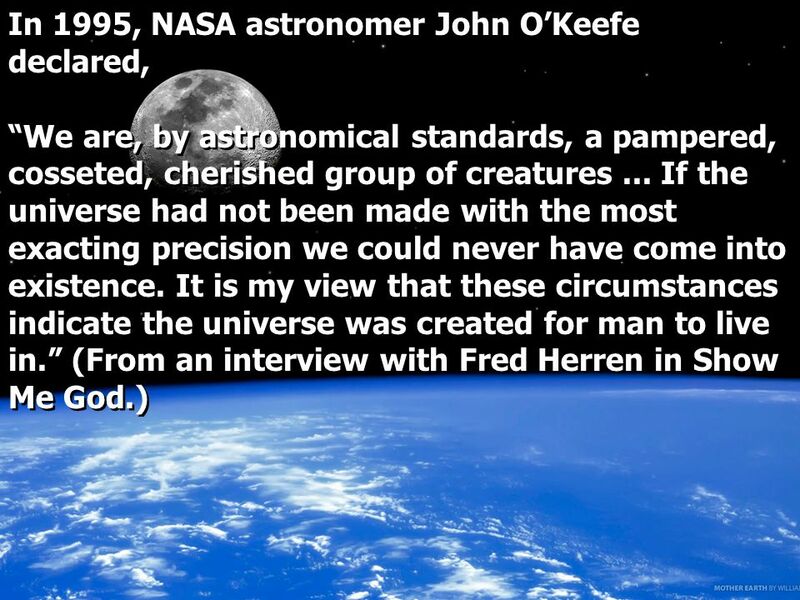 This argument states that every creation must have a creator. 10 Where did our universe come from? There are only three possible answers to this question. 1. 1. Our universe is eternal. In other words, it has always existed. 2. 2. Our universe created itself from nothing. 3. 3. Our universe was created by something or someone. Where did our universe come from? There are only three possible answers to this question. 1. 1. Our universe is eternal. In other words, it has always existed. 2. 2. Our universe created itself from nothing. 3. 3. 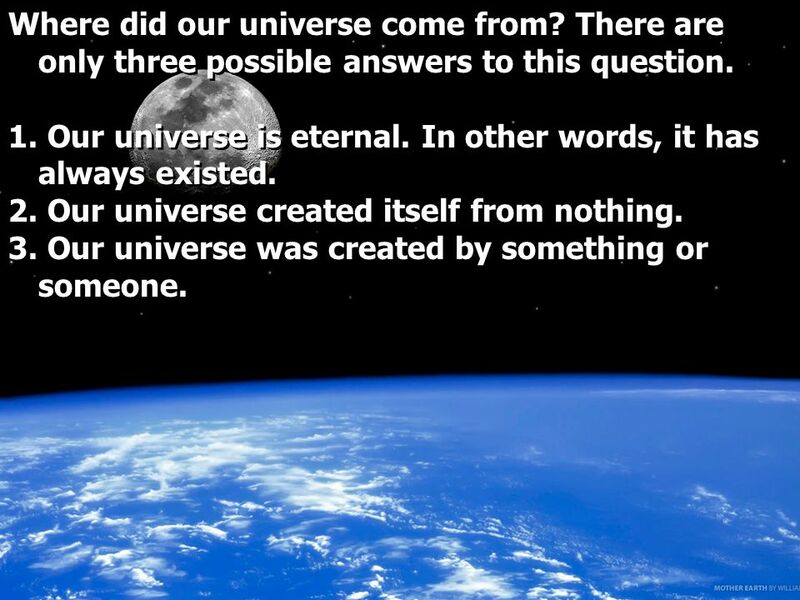 Our universe was created by something or someone. 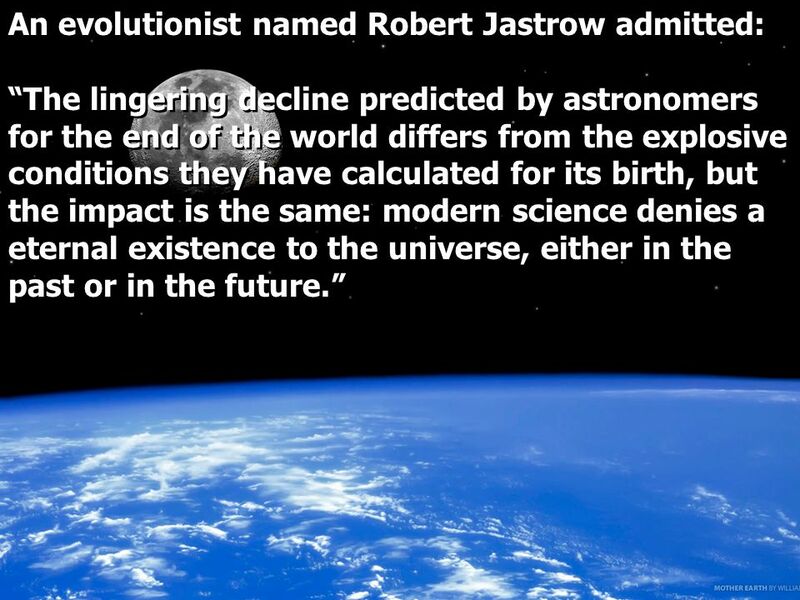 11 An evolutionist named Robert Jastrow admitted: The lingering decline predicted by astronomers for the end of the world differs from the explosive conditions they have calculated for its birth, but the impact is the same: modern science denies a eternal existence to the universe, either in the past or in the future. An evolutionist named Robert Jastrow admitted: The lingering decline predicted by astronomers for the end of the world differs from the explosive conditions they have calculated for its birth, but the impact is the same: modern science denies a eternal existence to the universe, either in the past or in the future. 12 The fact that our universe exists and that it had a beginning means that it came into existence by something or someone that is eternal because if something cannot come from nothing then our universe had to come from something or some person that is eternal. That something (or better yet someone) is God just as Genesis 1:1 reads: Genesis 1:1 In the beginning God created the heavens and the earth. The fact that our universe exists and that it had a beginning means that it came into existence by something or someone that is eternal because if something cannot come from nothing then our universe had to come from something or some person that is eternal. That something (or better yet someone) is God just as Genesis 1:1 reads: Genesis 1:1 In the beginning God created the heavens and the earth. 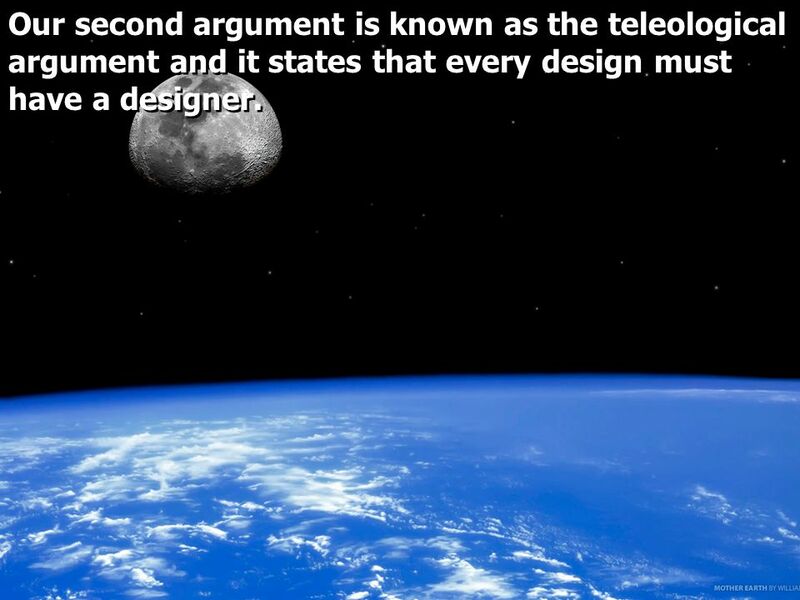 14 Our second argument is known as the teleological argument and it states that every design must have a designer. 16 The size of our Universe is impressive. While its outer limits have not been measured, the best estimate we have is that it is about 20 billion light years in diameter containing an estimated 1 Billion galaxies and somewhere around 25 sextillion stars. 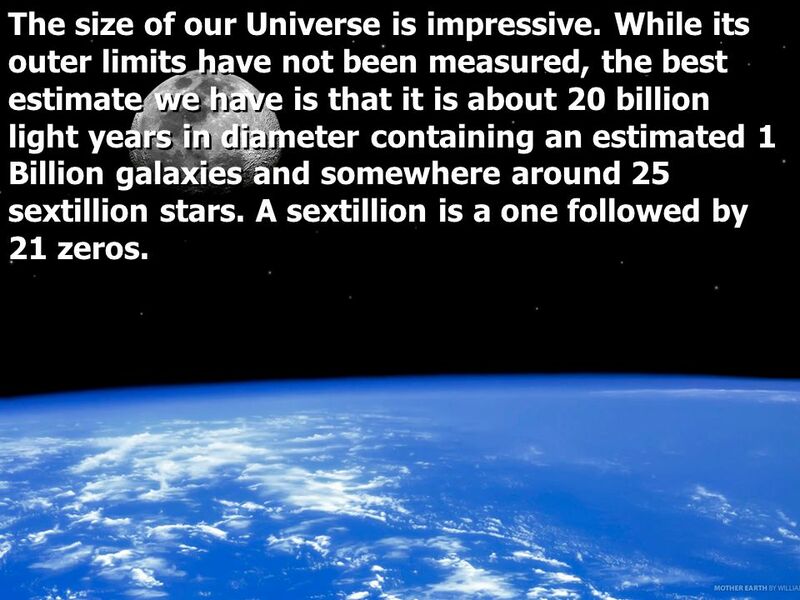 A sextillion is a one followed by 21 zeros. 17 Psalm 147:4 He counts the number of the stars; He calls them all by name. 5 Great is our Lord, and mighty in power; His understanding is infinite. Psalm 19:1 The heavens declare the glory of God; And the firmament shows His handiwork. Hebrews 3:3 For this One has been counted worthy of more glory than Moses, inasmuch as He who built the house has more honor than the house. 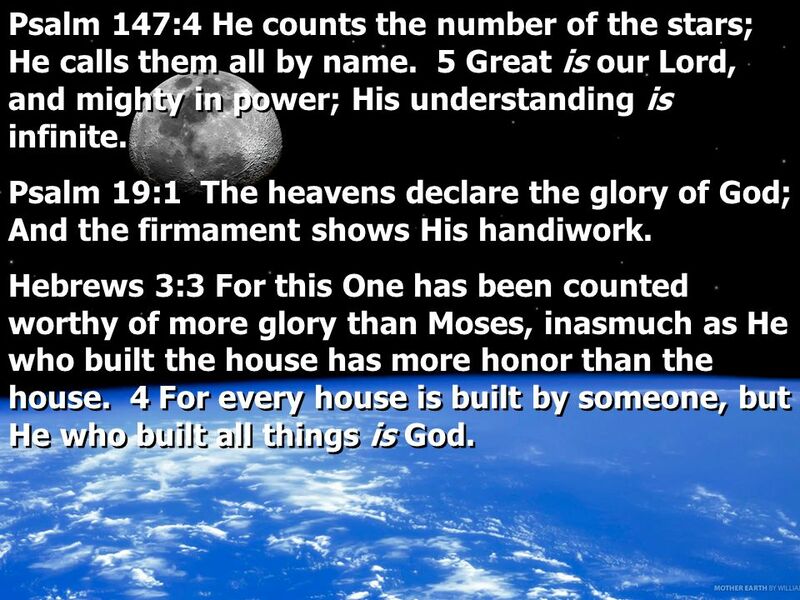 4 For every house is built by someone, but He who built all things is God. Psalm 147:4 He counts the number of the stars; He calls them all by name. 5 Great is our Lord, and mighty in power; His understanding is infinite. Psalm 19:1 The heavens declare the glory of God; And the firmament shows His handiwork. Hebrews 3:3 For this One has been counted worthy of more glory than Moses, inasmuch as He who built the house has more honor than the house. 4 For every house is built by someone, but He who built all things is God. 18 Since we are 93 million miles from the sun, we are also spared from the destructive pressures waves from the sun as it converts matter into energy. If the earth were 10% closer or further away from the sun, it would spell doom for life on earth. 19 Even the speed at which our planet rotates is a design because if it rotated faster fierce cyclones would continuously be formed over the face of the earth. 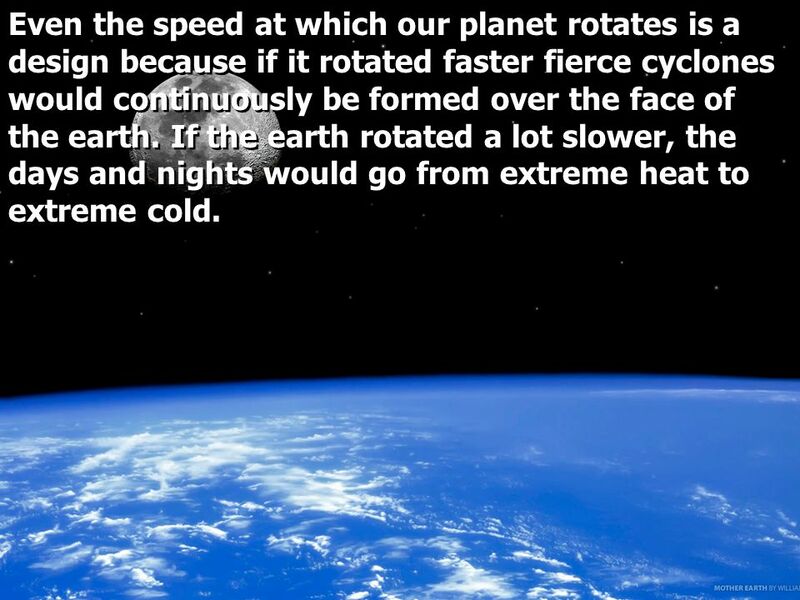 If the earth rotated a lot slower, the days and nights would go from extreme heat to extreme cold. 20 We also know that the earth moves in an orbit around the Sun, but it departs from a straight line by 1/9th of an inch every 18 miles. 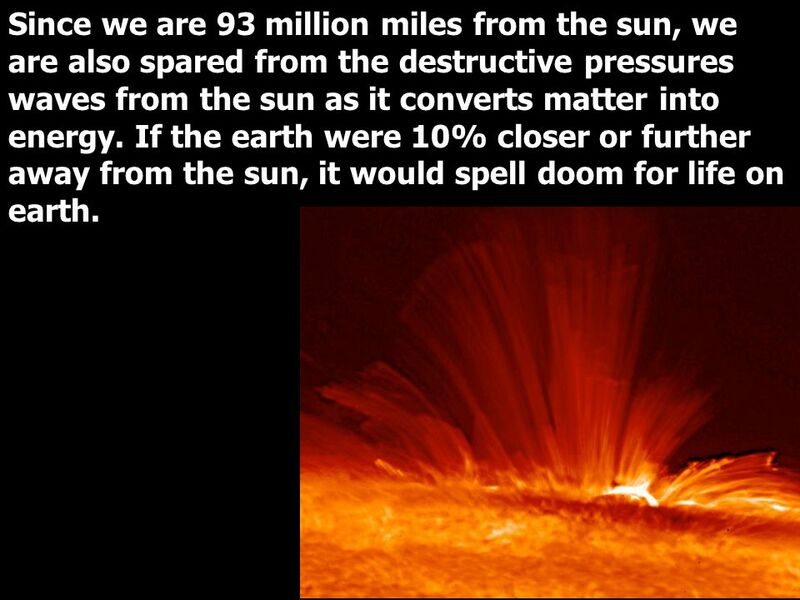 If it departed by 1/8th of an inch, we would get to close to the Sun and we would be incinerated. 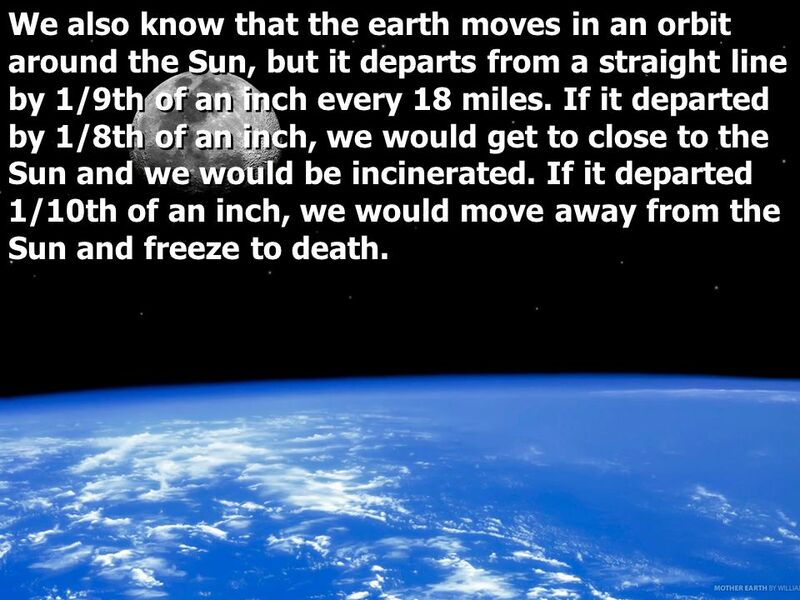 If it departed 1/10th of an inch, we would move away from the Sun and freeze to death. 21 We also know that the earth is tilted exactly 23.5 degrees. If were not tilted there would be no seasons. The tropics would be hotter and the deserts would get bigger. 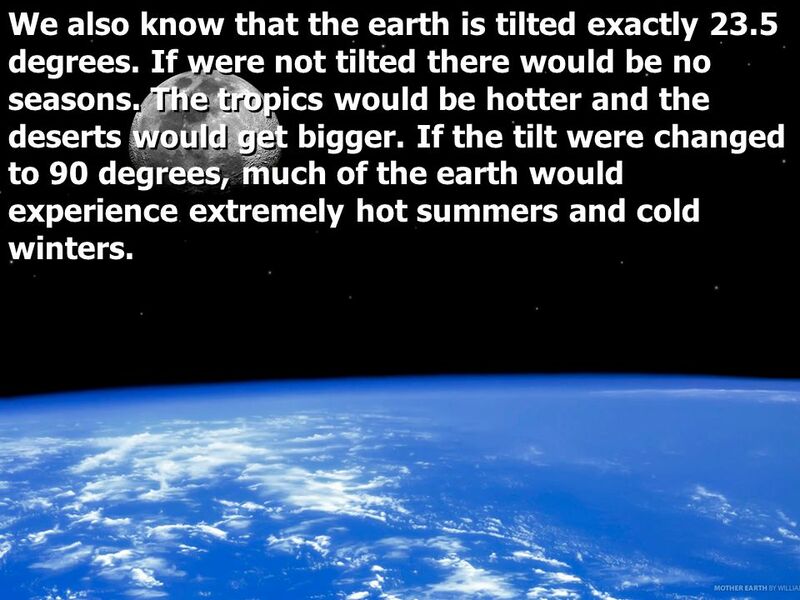 If the tilt were changed to 90 degrees, much of the earth would experience extremely hot summers and cold winters. 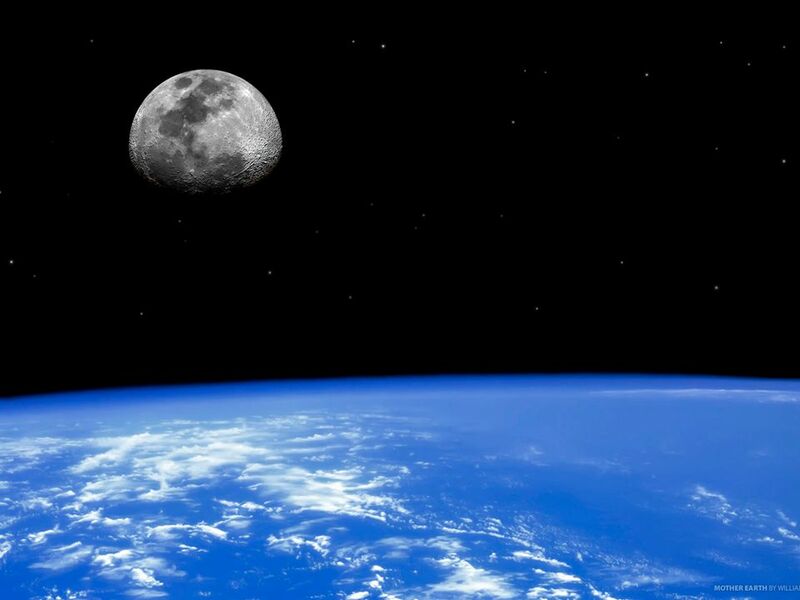 22 The moon is 240,000 miles from the earth. It too is just in the right spot to control the movement our tides and keep the life in the ocean alive. 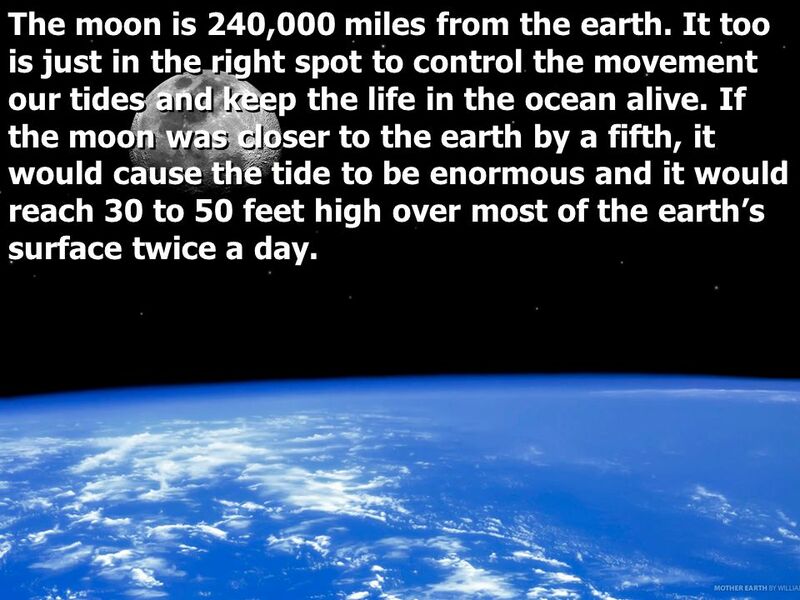 If the moon was closer to the earth by a fifth, it would cause the tide to be enormous and it would reach 30 to 50 feet high over most of the earths surface twice a day. 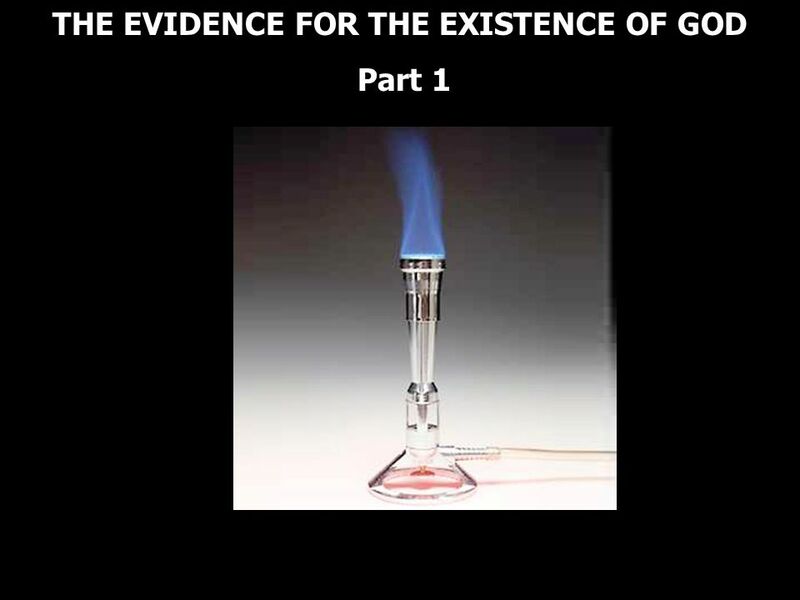 Download ppt "THE EVIDENCE FOR THE EXISTENCE OF GOD Part 1 THE EVIDENCE FOR THE EXISTENCE OF GOD Part 1." Evidence of God In His Creation Genesis 1:1-5 Reasonedtruth.com. Old Earth Ministries Homeschool Series Creation The Fourth Day. Does the Earth evince design? 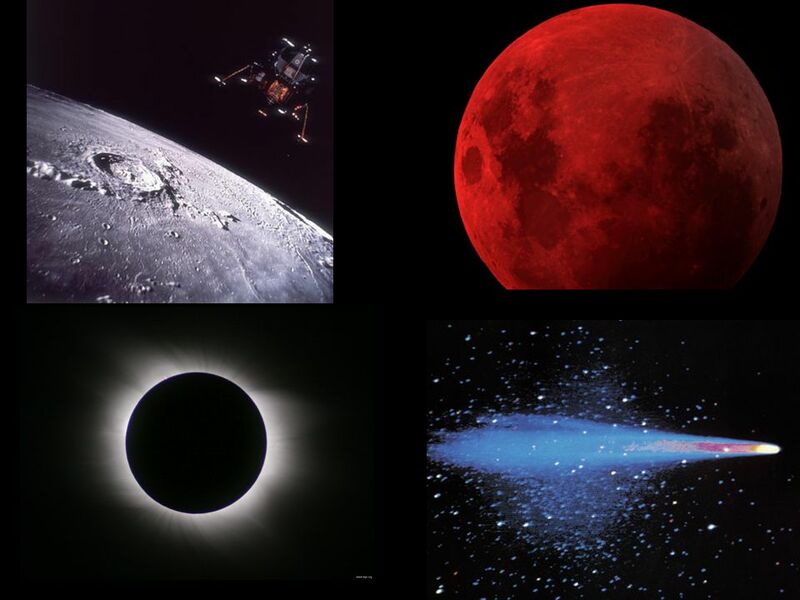 If the Earth evinces purposeful design, there must have been a designer. If the Earth evinces purposeful design, there must. Praying Jesus’ Way. Praying Jesus’ Way (Part 2) Praying Jesus’ Way Two basic principles of understanding the Bible 1.The genre of literature historical. God’s Plan A – ‘The Local Church’. What is the Purpose of the Church? The Glory of God… The Heavens Declare…. Design Demands a Designer There is intricate, incredibly complex design all throughout our universe from the smallest. Walk in the Light Text: Isaiah 50:10-11 Uncovering Religion/Truth, Judgment and Eternity. The Thesis of Psalm 66 The L ORD is worthy of universal praise because of His mighty works of deliverance in the past and because He is ever faithful to. Questions To Ponder  Does it really matter if God created the world or not? What about theistic evolution? Is it wrong to look for natural processes to.